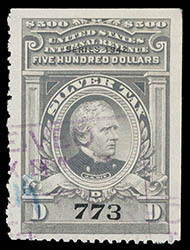 Revenue, 1862, First Issue, 1¢ Express, part perf, partially perforated strip of four, o.g., scarce multiple; light crease between first and second stamps, light crease on second stamp, small oil spot on third stamp, scarce multiple., Fine. Scott No. R1b $400 as 2 used pairs. 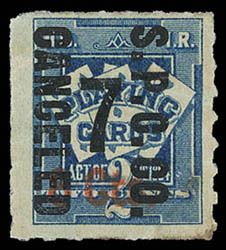 Revenue, 1862, First Issue, 70¢ Foreign Exchange, part perf, horizontal pair, scarce part perf pair on piece with R63c and R24c (2 singles), F.-V.F. 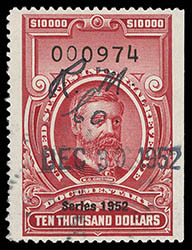 Documentary, 1942, $60 carmine, light manuscript cancel, fresh; usual natural straight edge at right and top, F.-V.F. 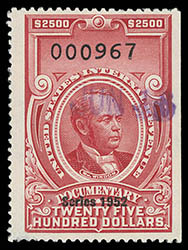 Documentary, 1952, $2,500 carmine, fresh and attractive, handstamp date cancel; usual natural straight edge at right, small trivial surface scuff at bottom left, otherwise Very Fine. 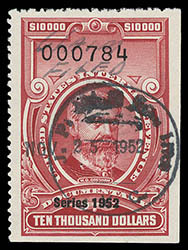 Documentary, 1952, $10,000 carmine, handstamp and light cut cancels; usual natural straight edge at right; neatly reperforated at bottom, Very Fine appearance. 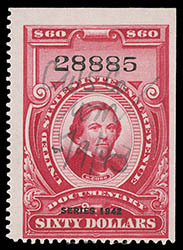 Documentary, 1952, $10,000 carmine, handstamp, manuscript and cut cancels; usual straight edge at right and bottom; a couple insignificant tiny staple holes, Very Fine. 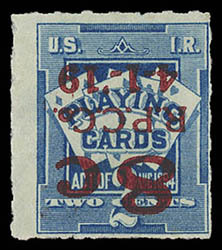 Playing Cards, 1919, 8¢ on 2¢ blue, inverted overprint as always, mostly large margins except at right, Fine, a very difficult stamp to find in sound condition. 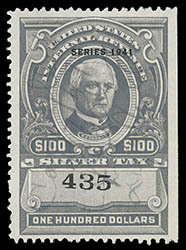 Silver Tax, 1941, $100 gray, rich color, wide margins, unobtrusive manuscript cancel; usual natural straight edge at right, tiny perf thin at left, without gum as issued, still Very Fine. Silver Tax, 1942, $500 gray, attractive light magenta handstamp and blue manuscript cancels, wonderfully well centered, a couple of nibbed perfs and very faint crease, otherwise Very Fine, an extremely rare stamp and seldom offered; with 2017 P.F. 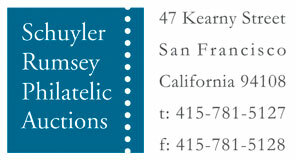 and 2003 A.P.S. certificates.